While there's a thread on the pre-revolutionary variety of this award, there seems to be no thread on its recent incarnation. 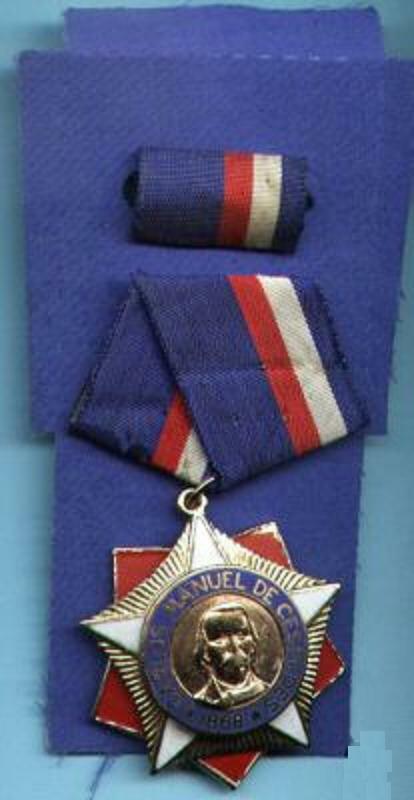 See also http://gmic.co.uk/index.php?showtopic=14320 for the old award. HAVANA -- In a ceremony honoring the father of Elian Gonzalez, Cuban President Fidel Castro said the 6-year-old boy's return to his native land was the most emotional moment of his revolutionary life. 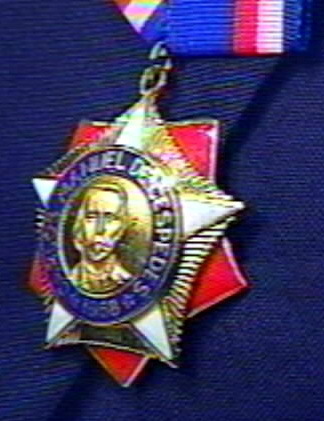 As Castro presented Juan Miguel Gonzalez with the Carlos Manuel de Cespedes medal after a two-hour ceremony, he recalled other key moments in his political life, such as the 1959 Cuban revolution and the Bay of Pigs invasion of 1961. "In none of these occasions during our struggles did I experience such intense emotion as when, upon the opening of the doors of the small plane that brought them from the United States ... I saw emerge ... the figures of Juan Miguel and Elian," Castro said. "A small boy and a humble Cuban father, whom few people knew just a few months ago, were returning transformed into giant moral symbols of our fatherland." Castro praised Gonzalez for resisting pressures to stay in the United States. Speakers during the nationally televised ceremony called Elian's father a patriot who refused to sell out. But Gonzalez, who had tears in his eyes when the medal was pinned to his dark suit, had a more simple explanation. "I owe this to all the people of Cuba," he said. "I have not done anything that any other father who loves his son wouldn't have done. Nothing that any Cuban who feels worthy of his revolution and socialism wouldn't have done." Before the presentation a resolution by Cuba's ruling Council of State was read out by Ricardo Alarcon, president of the country's National Assembly and Gonzalez's main government adviser during the battle for his son. "Juan Miguel Gonzalez stoically endured the most cruel suffering of his son, of himself and of his family," it said. The resolution compared Elian's father with Cespedes, a 19th century hero who fought for Cuba's independence from Spain. The boy at the center of the storm since being plucked from the sea off Fort Lauderdale, Florida, during Thanksgiving weekend last year, was driven from Havana to Cardenas, his home town, for the first time on Monday since his return to Cuba. Elian, who had only known Cardenas before being taken by his mother on a makeshift boat nearly eight months ago, had reportedly been asking his father when he'd be going to Cuba. The trip was reportedly arranged to show the 6-year-old he was home, although according to officials he won't be returning permanently for several more weeks. State television showed pictures of Monday's trip on Wednesday night, with images of Elian riding his bicycle and splashing in a pool at a nearby resort. On the streets of the small port city, scores of residents cheered as a bus carrying the family drove by. Elian was shown rummaging through his clothes and toys at the homes of his paternal and maternal grandparents. He looked happy to find a pair of inline skates, which he tried on over bare feet and skated a little down a hallway. At his school he was greeted by classmates and a teacher leaned down to show him a book. 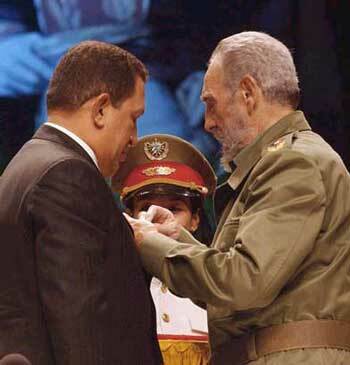 President of Venezuela Hugo Chavez received this order from Fidel Castro on 14.12.2004 (Habana, Karl Marx Theatre). 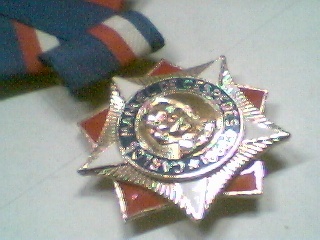 Not a great image, but the only one that I know of right now of the Castro era award. 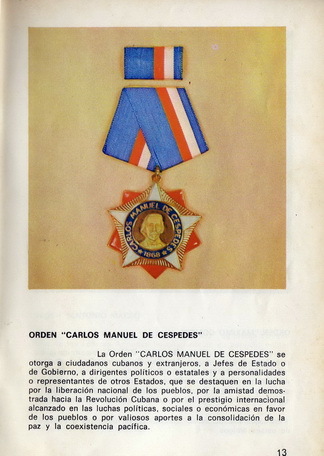 Orden "Carlos Manuel de C?spedes"